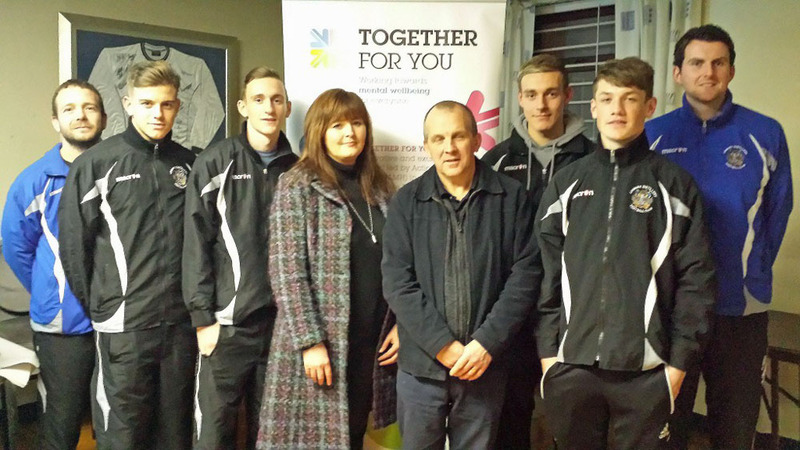 Andrea Warwick, Employment Officer at Action Mental Health in Derriaghy joins members of Lisburn Distillery Football Club as they benefit from one of their MenSsana “Provoking Thought” workshops for young people, part of the Together For You project, funded by the Big Lottery Fund. Ordinarily, a Tuesday night at Lisburn Distillery Football Club grounds might see a group of young boys come together for football practice or to watch a game. However, Tuesday 10th December saw them come together to look after their mental, rather than their physical, health. Action Mental Health (AMH) delivered the first of a series of workshops in Mental Health Awareness for 14-19 year old boys. The “Provoking Thought” workshops are funded by The Big Lottery Fund as part of the Together For You project which is led by AMH. The project team works closely with schools, colleges and other agencies to promote positive mental health among young people, through the provision of information and resources. During the workshops project staff provide an interactive presentation to enhance the young people’s understanding of mental health and highlight its relevance and importance for their lives. Group discussion then offers an opportunity to reflect on major sources of stress and identify possible coping strategies. Last year the MensSana workshops were delivered to over 5,000 young people. Last year AMH helped 67 clients to gain employment, 52 clients moved on to further training/education programmes and 84 clients undertook voluntary work. If you are a local business or organization who would like to know more about offering placement, fundraising or other support to AMH, contact Andrea on 028 9062 9759. Together For You is funded by the Big Lottery Fund Northern Ireland. The project, led by Action Mental Health (AMH) in association with Aware Defeat Depression, CAUSE, CRUSE, MindWise, Nexus, PraxisCare and Relate NI, will promote mental health and wellbeing in Northern Ireland and provide a range of services in new and innovative ways.